Carnac, on the south coast of Brittany in the Bay of Biscay, is one of Brittany's most trendy holiday resorts. The family-friendly holiday resort of Carnac Plage is bright and breezy, sporting a sand-duned peninsula, a lovely stretch of beach, plenty of entertainment, and various fun in the sun facilities. Visitors will have plenty to amuse them from watersports to more traditional tourist sightseeing. 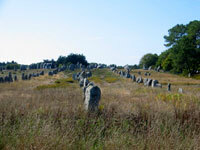 Ironically, this popular holiday area is located alongside one of Europe's most important, ancient, and mysterious archaeological sites: just north of the seaside town, hundreds of massive standing stones, even older than Stonehenge or the pyramids of Egypt, are aligned in rows in a field. The original purpose of these mystical monuments is unknown and visitors will no doubt come up with their own theories while wandering around the ancient site. The nearby Musée de Préhistoire complements these fascinating relics with displays of artefacts dating as far back as 450,000 BC. Such attractions ensure that Carnac has more to offer than just pretty beaches and travellers will enjoy the diversity of things to see and do in the area.